With the end of the fossil fuel era and the transition to sustainable power, energy storage mechanisms are requested to meet the new demands for energy storage of intermittent sources and high demands for electronic transportation. To come up with new solutions traditional boundaries must be challenged. Therefore professors and students from Chemical Engineering cooperate with their colleagues from Applied Physics and Material Engineering to create interdisciplinary playground, focusing on chemical energy storage we explore the limits of state of the art materials, while at same time develop new promising candidates. The improvement of Li-ion battery performance requires development of models that capture the essential physics and chemistry that is happening in Li-ion battery electrode materials. 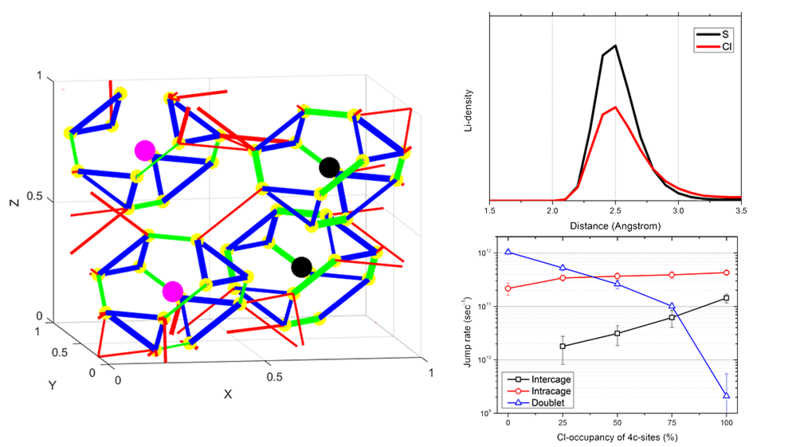 Phase-field modeling has shown to have this ability, providing the opportunity to gain understanding of the complex interactions happening in a battery during (dis)charge. 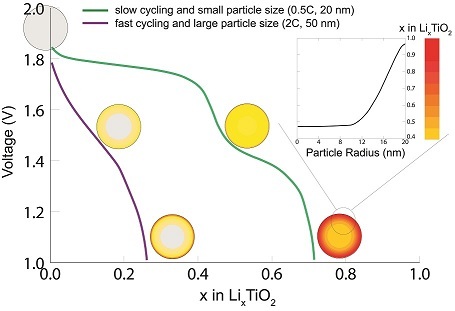 In this paper, a novel electrochemical phase-field model is presented that captures the thermodynamic and kinetic properties of lithium insertion in TiO2-anatase, a well-known and intensively studied Li-ion battery electrode material. 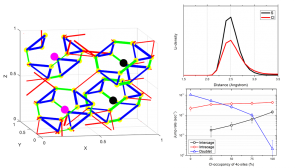 Previous elaborate experimental work on anatase TiO2 provides all parameters necessary for the phase-field simulations, giving the opportunity to gain fundamental insight and validate this phase-field model. The model shows that, unlike other electrode materials, the kinetic limitations of individual anatase particles limit the performance of full electrodes. Hence, improving the performance of anatase TiO2 electrodes requires increasing the Li-diffusion in anatase particles. First principle DFT calculations are used to study the thermodynamic and kinetic properties of Na-ion insertion in TiO2 hollandite, a potential anode for Na-ion batteries. 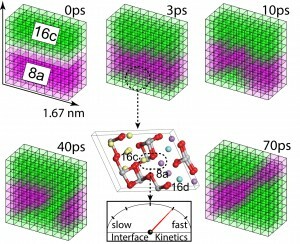 The experimentally observed phase transformation from tetragonal TiO2 (I4/m) to monoclinic Na0.25TiO2 (I2/m) is confirmed. 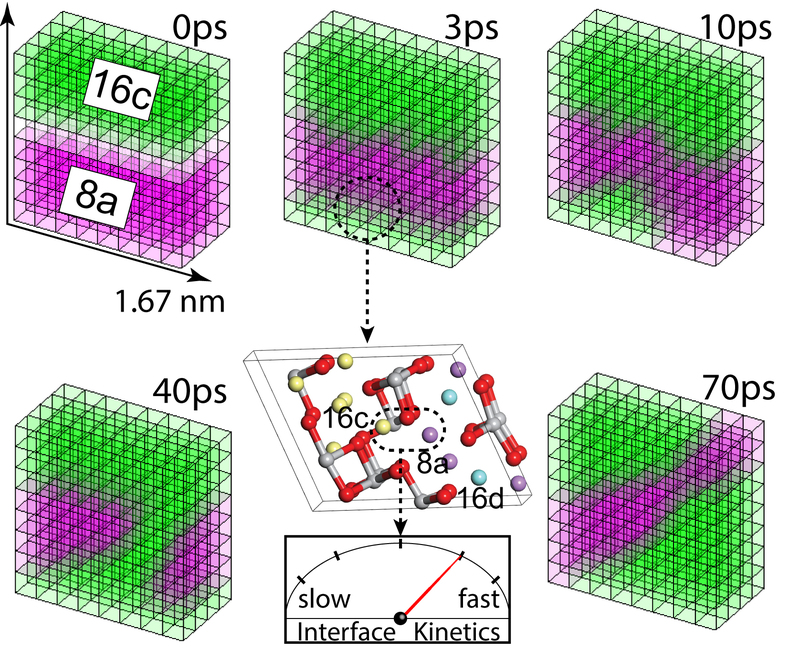 At high Na-ion concentrations the calculated formation energies predict a first order phase transition towards the layered O’3-Na0.68TiO2 structure. 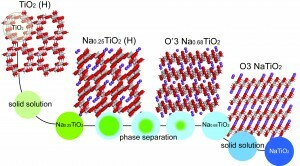 Further sodiation initiates a solid solution reaction towards the layered O3-NaTiO2 phase, which was recently brought forward as a promising anode for Na-ion batteries. This transformation irreversibly transforms the one dimensional Hollandite tunnel structure into the layered structure, and potentially brings forward an alternative route towards the preparation of the hard to prepare O3-NaTiO2 material. Energy barrier calculations reveal fast Na-ion diffusion at low concentrations and sluggish diffusion upon reaching the N0.25TiO2 phase, rationalizing why experimentally the Na0.5TiO2 phase is not achieved. Detailed analysis of the kinetic behaviour in the hollandite structure via Molecular Dynamics simulations reveal the importance of correlated atomic motions and dynamic lattice deformations for the Na-ion diffusion. 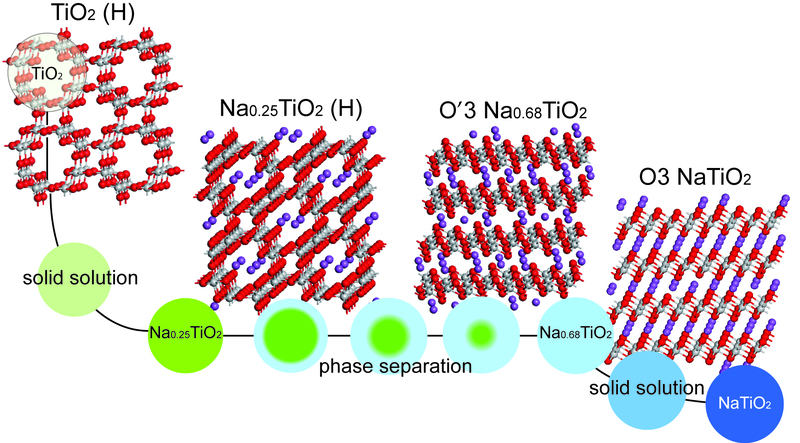 In addition, exceptional Na-ion kinetics were predicted for the layered O’3-Na0.75TiO2 phase through a dominating divacancy hopping mechanism. In an effort to keep up with the increasing demands for energy storage, lithium sulfur (Li-S) batteries receive a lot of research attention as they are considered one of the most promising technologies to replace the current lithium-ion batteries. 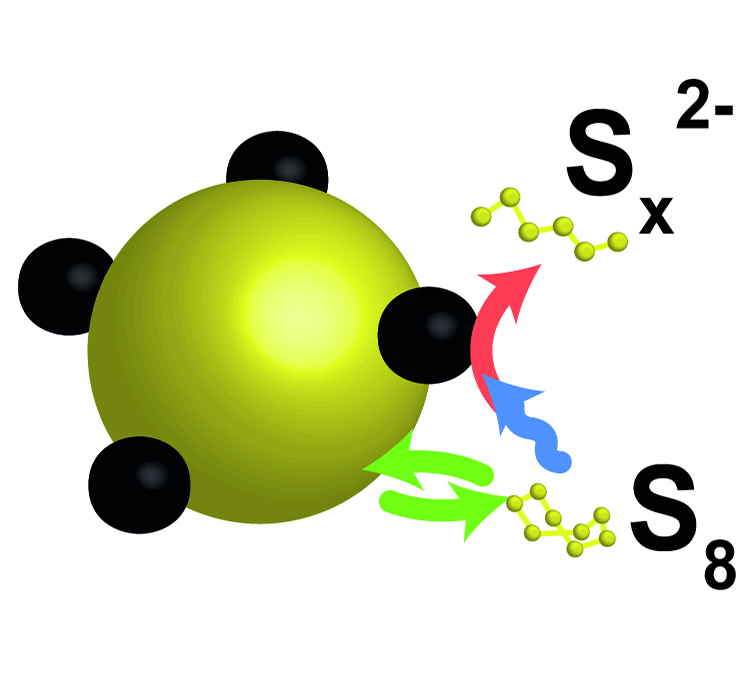 Sulfur has the ability to reversibly store 2 electrons per atom and is an abundant, benign, and low cost material. However, sulfur also has an extremely low electrical conductivity. Using a highly resistive active material in a battery normally means severe (ohmic) losses, and is therefore seen as a large obstacle for the efficient storage of energy. 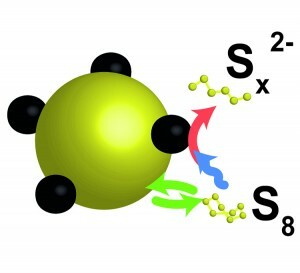 This is in conflict with the relative ease with which sulfur can be applied as electrode material, evidenced by the many promising results obtained for Li-S batteries over the last few years. In our recent publication, we assessed the implications of the non-conductive characteristics of sulfur for the operating principles of the Li-S battery. By applying a simple but effective battery cell we showed that the dissolution of elemental sulfur, despite its low solubility in the organic solvent of the electrolyte, plays a significant role in the operation mechanism of the Li-S battery. From the results it was evident that sulfur can participate in the redox reactions as a dissolved molecule. In doing so the low conductivity of bulk sulfur is effectively circumvented; the electrons do not need to go through the bulk sulfur, but the dissolved sulfur goes to the electrons. Based on the electrochemical response of the special cells the researchers furthermore indicate that the non-conducting solid sulfur can be utilized indirectly by interactions with intermediate products that are formed during battery operation. These factors explain the relative ease with which this insulator can be applied as electrode material in liquid electrolyte cells. The use of liquid electrolytes makes current batteries prone to dangerous thermal runaway reactions, igniting the battery, as seen recently in the Samsung Note 7 phones. To make batteries safer the liquid electrolyte can be replaced by a solid electrolyte, which is not flammable. However, before solid electrolytes can be used the Li-ion conductivity must be equally good as in liquid electrolytes. Currently several solid electrolytes are known with Li-ion conductivities comparable to that in liquid electrolytes, one of which are lithium argyrodites. To gain a better understanding of Li-diffusion in lithium argyrodites density functional theory molecular dynamics simulations have been performed.The simulations showed that the position of halogen atoms in the crystals has a large impact on the Li-ion conductivity, and that altering the halogen positions in lithium argyrodites during synthesis could increase the Li-ion conductivity of these materials.